Prof. Ja-Hyoung Ryu received his BSc (2000) and PhD (2006) form Yonsei University, Korea under Professor Myongsoo Lee. After his postdoctoral research with Professor S. Thayumanavan in University of Massachusetts at Amherst, he became a faculty member of the department of chemistry in 2012 at Ulsan National Institute of Science and Technology. 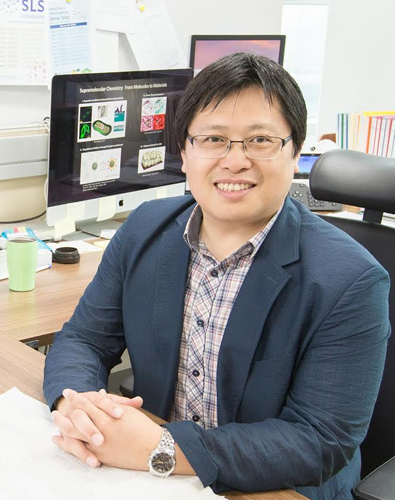 His current research interests include rational synthesis of supramolecular nanomaterials for the theragnostics, and intracellular supramolecular assembly for the control of the cellular function. Our research focus on establishing novel on demand self-transformable nano-architectures by external stimuli for nano-, bio-systems through elaborate molecular design and chemical synthetic tools. Based on our background in designing of organic molecules for well-organized nanostructure, analysis of the nanostructure, developing nanomaterials and biomaterials, we would like to develop novel transformable nanostructures and focus on their function in bio, nanotechnology such as control of the cellular function and novel inorganic-, organic hybrid material. - Rational synthesis of supramolecular nanomaterials for nano-theragnostics and sustainable nanomaterials. - Supramolecular assembly for control of the cellular function. 초분자 나노재료 연구실에서는 유기합성을 통해 자극에 반응하는 유기분자, 고분자를 이용한 항암 약물전달, 암세포 센싱, 초분자 자기조립현상, 합성단백질 구조및 세포내 기능을 연구 하고 있습니다. 관심 있는 학부생, 대학원생 및 연구원을 모집합니다. 본 연구실에 관심 있으신 분은 아래의 연락처로 연락주시기바랍니다. "Cloaking nanoparticles with protein corona shield for targeted drug delivery"
Nat. Commun. 2018, 9, 4548. "Intra-Mitochondrial Biomineralization for Inducing Apoptosis of Cancer Cells"
Chem. Sci. 2018, 9, 2474. "Cancer Mitochondria-Targeted Photodynamic Therapy with Supramolecular Assembly of HA and Near IR Cyanine Dye"
Chem. Sci. 2017, 8, 8351. "Intra-mitochondrial assembly of peptide amphiphiles for cancer therapy"
Nat. Commun. 2017, 8, 26. J. Am. Chem.Soc. 2015, 137, 4358-4367. “Noncovalent Polymer-Gatekeeper in Mesoporous Silica Nanoparticles as a Targeted Drug Delivery Platform"
Adv. Funct. Mater. 2015, 25, 957-965.